In a saute pan, add 2 tablespoons of olive oil and the finely diced onions into the pan. Add salt & pepper to the onions. Stir slowly for about 10 minutes. 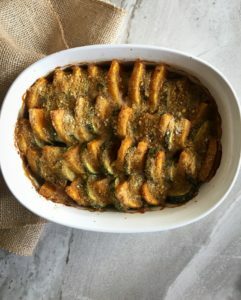 Mix the zucchini slices and butternut squash with the rest of the olive oil, garlic powder, Cajun and Italian seasoning. In a 9 x 13 casserole dish, add the onions to the bottom of the casserole dish. Stack the seasoned veggies by alternating them on top of the onion mixture. So, one wedge of butternut squash then 1 slice of zucchini and so on. Cover with aluminum and place in preheated oven for 20 minutes. Then boost the heat to 375 degrees and uncover the dish; add 1/2 a cup of chicken broth and bake for another 15 minutes. 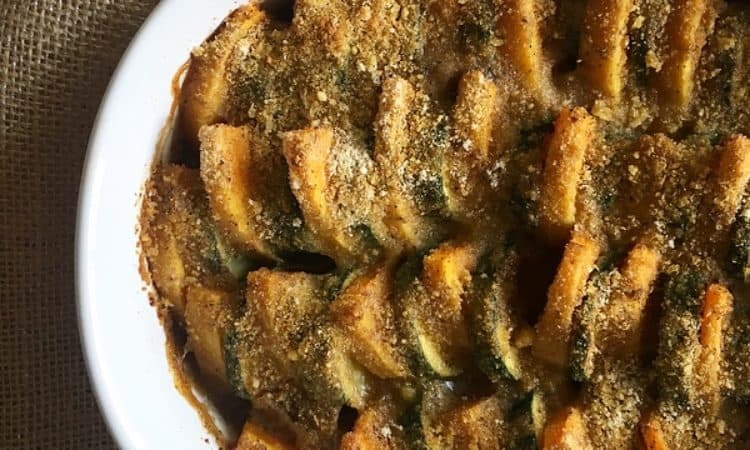 Mix the breadcrumbs and Parmesan together and place aside. After taking out the casserole dish, sprinkle the breadcrumb mixture on top and boost the heat to 400 degrees still remaining uncovered. Bake for another 20 minutes till veggies are tender and top is slightly browned.